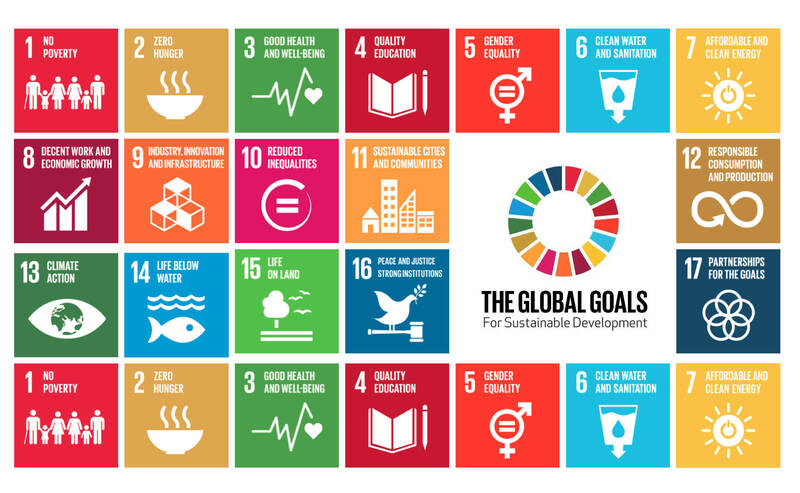 At the heart of the Sustainable Development Agenda is the call to action for everyone to do their part: governments, the private sector, civil society leaders and individuals around the world. 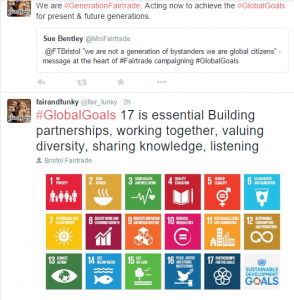 Following on from the huge success of the 9th International Fairtrade Towns Conference, Bristol Fairtrade Network and Bristol Green Capital Partnership have been working together to raise awareness of the links between Fairtrade and Sustainability. A video commission for the conference asked ‘How Green is Fairtrade?‘ and after the conference, inspired by Bristol’s degree of collaboration and partnerships, 72% of the delegates said that they will use the information they learnt at the Conference to connect with local sustainability groups in their own towns and cities. To coincide with the launch of the 17 Global Goals, we invited Fair Trade and Sustainability campaigners to raise awareness of how crucial Fair Trade principles are in achieving the new Sustainable Development Goals. Environmental protection is a key element of Fair Trade’s view of sustainability, and Fair Trade’s work on improving environmental protection and climate change adaptation helps to deliver this goal. Fair Trade Standards prohibit the use of certain agrochemicals and focus on reducing the use of pesticides, ensure that farms are free from hazardous waste and are using water sustainably, and encourage activities to enhance biodiversity. Fair Trade standards also promote training for farmers, which can include advice on switching to environmentally friendly practices, such as developing nutrient-rich soils that support healthy plants and encouraging wildlife to help control pests and diseases. Beyond the Standards, the Fairtrade Premium is used to fund a range of projects and training that promotes environmental sustainability. For example, converting to organic production, which can be challenging for farmers because of the extra costs involved, but may mean earning a higher price for their crop and becoming more resilient to environmental shocks. 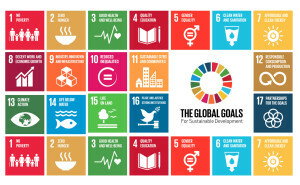 In his blog ‘The Malnourished Are Outnumbered by the Obese‘, Michael Gidney, CEO of the Fairtrade Foundation argues that the Sustainable Development Goals are an unprecedented opportunity to reform the structures and power dynamics that keep people in poverty, particularly in the area of trade. ” ‘Goal 12 – ensure sustainable consumption and production patterns’ — sounds obvious, but its inclusion recognizes just how unbalanced production and consumption have become. Two billion people depend on agriculture for a living, but still half the world’s hungry are farmers. Our food system is badly out of balance: consumers in richer countries expect ever cheaper food, yet we throw away one-third of all the food we buy. The connection between value and price has been broken — in the U.K., we pay less for our food than ever before. There are more than 700 million malnourished people in the world, but now they are outnumbered by the obese. There is widespread use of agro-chemicals with little thought to the future ecosystem. What can be done to turn this around? Read more about how Fair Trade standards support environmental protection and climate change here.